I just got out of a screening of Craig Zobel's Great World of Sound at Winston-Salem's Southeastern Center for Contemporary Art (SECCA), and I must say I was pleasantly surprised. 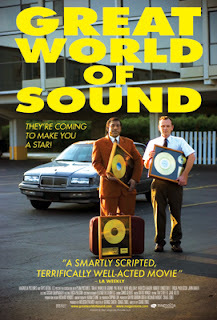 It is a clever little comedy about two out-of-work guys (Pat Healy and Kene Holliday) who take jobs as talent scouts for a small record company called Great World of Sound that isn't exactly on the up and up. In fact it's a total fraud, taking money from its "talent" and then abandoning them. The two scouts don't realize this of course, their too busy playing salesman by doing their trained pitches and making it all sound great. Which it isn't. And as things get worse for them, they begin to realize that they're being used, and are hurting others in the process. That's where this sharply written comedy becomes something much more poignant. There is an underlying sadness here about not only what people are willing to do for money, but what people are willing to do to achieve their dreams. And also what they are willing to believe. Most of the musicians the pair meet are not particularly talented. But they buy into the irresistible pitch of Great World of Sound thinking their investment will bring them fame and fortune...when really it will bring them nothing at all. It is an interesting commentary in this era of American Idol, where people become so desperate for fame that they will do anything it takes to see their name in lights, only to come crashing down as victims of their own naiveté. Of course, this doesn't necessarily bother those who are profiting off the unwitting victims' crash and burn. Is there something to be said there in our own desire to watch people fail on national TV - where huge corporations make millions off of their failure? Great World of Sound was directed by Craig Zobel, a graduate of the North Carolina School of the Arts, and takes place mostly in Charlotte, NC. So its nice to see local talent get such major recognition. It was nominated for 3 IFP Gotham Awards - Best Feature (where it competed against I'm Not There, Into the Wild, Margot at the Wedding, and The Namesake), Breakthrough Director, and Breakthrough Actor (Holliday) - and took home the award for Breakthrough Director. What is even more exciting is that Great World of Sound is a world class film, and an exciting debut born right here in North Carolina. It is sharply written and winningly acted, with Healy and Holliday both creating memorable characters. In fact my only quibble is that the interview scenes become a bit redundant after a while. But the film never loses its edge or its charm. Zobel's screenplay (co-written with George Smith) is smart, funny, and incisive, and more layered than most anything you will find playing at the local multiplex on any given day. This is real filmmaking, low-budget, on the fly, and untainted by big budget Hollywood commercialism. Zobel has crafted a winner here - a promising debut film that heralds the arrival of a thrilling new talent. If this is any indication, Zobel, unlike many of the characters in his film, has great things coming to him. I can't wait to see what he does next. The film is showing again at SECCA on Sunday, December 9 at 2:00 PM. For more information, visit www.cinemasociety.org.